How long it will take to deliver my order? Artworks are handmade on request and take 1-3 days to be completed and shipped. Courier delivery times are 48 hours in Italy, 3-5 days in Europe and 6 – 7 days in USA. We will provide you a tracking number to check your package status. What kind of payment methods are allowed on the shop? All transactions are processed through the secure servers of PAYPAL. You can pay using your Paypal account if you have one or directly using your credit or debit card. A Paypal account is not mandatory. Which artwork sizes are available on the shop? Actually artworks are available in only one standard size: 35×50 cm wood panel, with 1cm thickness. If you need a bigger one, consider buying multiple artworks and combining them on the wall. They all have the same chromatic scheme, so they will look beautiful together, even with different subjects. How many artworks can be sent in a single order / shipping? The cart has a maximum quantity of 6 artworks. It’s a safety precaution to ensure that our package is strong enough to keep them well protected during shipping. If you desire to buy more than six artworks, just add them to a second order. I haven’t found my favourite character/subject/movie in the shop. Can you make a paint on request? Yes, we can make custom orders! Let us know your needs using the contact form. My order is a gift. Can you write a message on the back of the Artwork for me? Sure! We can print your message on the back of the artwork in a cool, professional style! Send us your request after completing the order. This service is free of charge. My order is a gift. Do you have a gift wrapping option? Sure! You will find an option to add gift wrapping to your purchase in the cart page. 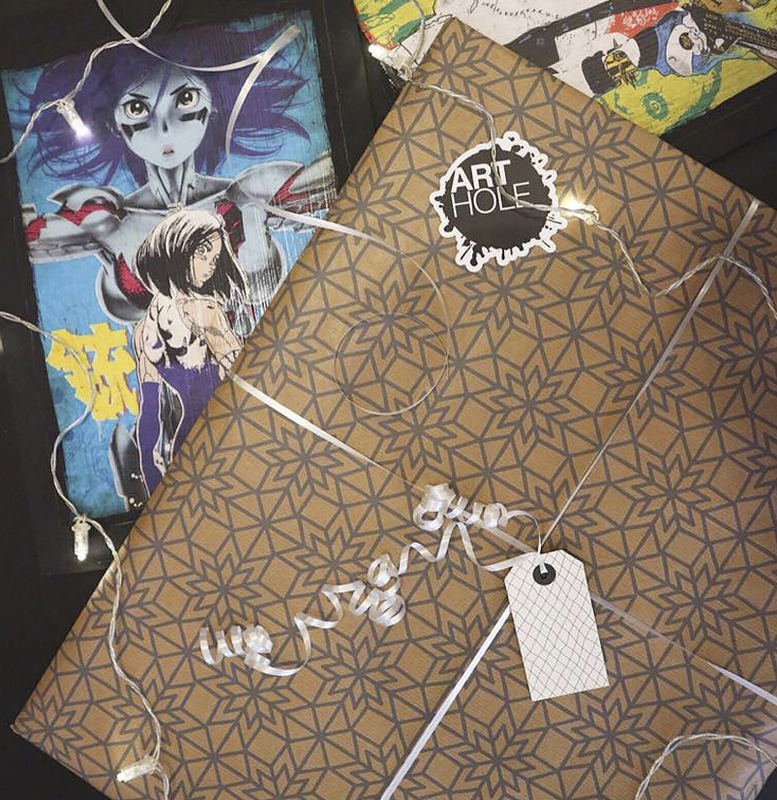 Your Artwork will be packaged with a beautiful wrapping paper and ribbon, ready to be given. You will have the option to add a written message too! See a Gift Wrap Sample clicking here. What if i am not satisfied of my purchase? We are absolutely sure that you will love our products. But if, for any reason, you will not feel satisfied by your purchase don’t worry! Send it back to us and we’ll issue a refund! We take maximum care in packing our products, using custom flat boxes and trusted couriers. Anyway if your package has been damaged, don’t panic! All our shipments have insurance. Let us know and we’ll manage to send you a brand new artwork for free, to replace the damaged one. Do you have other questions or doubts? Feel free to contact us using our contact form!